WASHINGTON — U.S. Air Force officials are uncertain about the future of a hypersonic aircraft flight test program after the third of four experimental vehicles veered off course due to a "faulty control fin" and crashed in the Pacific Ocean Aug. 14, the service said in an Aug. 15 statement. It was the poorest showing yet for the unmanned X-51A Waverider, designed to achieve speeds in excess of Mach 5 — five times the speed of sound — on the power of a supersonic combustion ramjet engine, also known as a scramjet. Unlike the previous two test flights, both of which were cut short by anomalies, controllers did not have the chance to ignite the Waverider’s scramjet engine in the latest test. "It is unfortunate that a problem with this subsystem caused a termination before we could light the scramjet engine," Charlie Brink, X-51A programmanager for the Air Force Research Laboratory (AFRL), said in a statement. "All our data showed we had created the right conditions for engine ignition, and we were very hopeful to meet our test objectives." The Waverider uses a solid-rocket booster to reach speeds approaching Mach 5, which is in the neighborhood of 3,100 mph (5,000 kph), before its air-breathing scramjet engine ignites to accelerate it to even greater speeds. The 4,000-pound (1,800 kilograms) vehicle is nearly 10 feet (3 m) long; the entire test stack including the solid-rocket motor and interstage measures nearly 26 feet (8 m). The Air Force will continue to evaluate what caused the failure, according to the service statement. The control fin cited as the culprit worked in previous flights, the service said. Boeing Defense, Space & Security of St. Louis built four X-51A aircraft on behalf of the AFRL and the military's Defense Advanced Research Projects Agency. The scramjet engines are built by Pratt & Whitney Rocketdyne of Canoga Park, Calif. 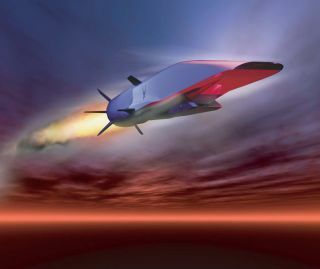 The first X-51A vehicle flew for more than three minutes at speeds that reached Mach 4.88 on scramjet power during a May 2010 test, according to the Air Force. That flight was terminated after controllers lost a telemetry link from the aircraft, the Air Force said. The second X-51A reached just over Mach 5 — considered the threshold for hypersonic flight— using its solid-rocket motor in a June 2011 flight. The scramjet ignited but failed to make the transition to full power and the mission ended prematurely, the Air Force said. AFRL officials have not decided whether the fourth X-51A aircraft will fly. Boeing also built the X-43A hypersonic flight demonstrator on behalf of NASA. The X-43A program made two successful flights in 2004: an 11-second flight that reached Mach 7, and a 10-second flight that approached Mach 10.